AVID WAS NOW King. He had great riches and honour, and a palace had been built for him. He had brought the ark from Kirjath-jearim, and placed it in the tabernacle prepared for it at Jerusalem, and he now reigned over all the people of Israel and Judah. But David did a very wicked thing. He took the wife of Uriah the Hittite for his wife, and caused Uriah to be slain. God was displeased at what he had done, and sent Nathan the prophet to reprove him. Nathan's reproof was given by a parable. It was a story of a poor man who had one dear little lamb. It grew up in his house, played with his children, and was very precious to him. But one day a traveller came to a rich neighbour, who possessed great flocks and herds, and this neighbour, instead of killing one of his own lambs and setting it before his guest, sent and took the poor man's lamb and killed it. David heard the story, and was very angry. He said the rich man should die, and the lamb taken away should be restored fourfold. 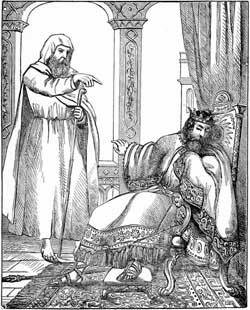 Then Nathan, looking at the King, said: "Thou art the man!" He showed David how greatly he had sinned, and told him that trouble and sorrow would come upon him for what he had done. God had given him riches and honour, and all that he could wish for; yet he had taken the one precious thing of Uriah's, even his wife, and had caused him to be slain. David was sorely grieved when he saw how wickedly he had acted. He confessed his sin to God, and God forgave it; but great trouble came upon the King afterwards through this crime.